The GPS Shrink-Down: How small can receivers get? GPS receivers appear everywhere these days, integrated into smart phones, vehicle dashboards, cameras, and more. They’re also shrinking—a variety of wrist-top models are available that track speed, distance, and location. 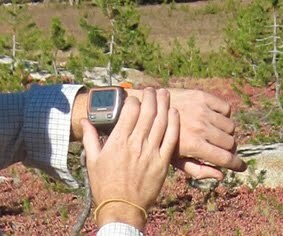 There’s a reason, however, why manufacturers dub these smallest GPS units “wrist-top computers” instead of “watches.” They still require a linebacker-sized wrist to fit comfortably and are much chunkier than their timekeeping brethren. When will we see GPS watches small enough to fit us all? This column originally appeared in the October online edition of AMC Outdoors. You can read the full story here.